My name is Kenny, I created this whole entire website, NerfGunRUs.com, I’m just your typical 21 year old kid that graduated from high school, got real jobs, went to technical college, tried another real job then another working with salmon, and ended up finding out building websites to be my most enjoyable job, working for myself. While I was learning to build websites, I discovered this was a real career choice that I really enjoyed doing, so I built my first 3 websites over the course of a year, then wanted to incorporate a little bit of family into my next website. 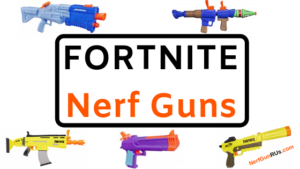 My nephews love Nerf Guns, they would bring them over and we would shoot each other, so I wanted my own, and I wanted to create a website all about Nerf Guns!!! I refuse to know less than my enemy, this is how I get my edge! I chose to review Nerf Guns to help anyone looking to use a certain Nerf Gun in a certain situation and whether they should use it. 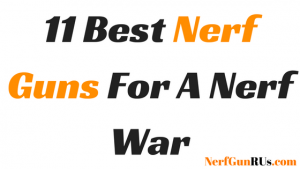 With this being said, I have reviewed so many Nerf Guns on this website, I guarantee you, that there is not a single person in the family who wouldn’t be able to select at least one Nerf Gun to fit their style! Nerf Guns are a way for literally anyone to have fun together, if you can watch someone play with Nerf Guns, you can get yourself involved too. That is my thinking and that is the reason I built NerfGunRUs.com, I believe in Nerf Gun Fun For All! Read my reviews and find a Nerf Gun that fits your style! I want to help anyone and everyone find a Nerf Gun to fit their style of Nerf Combat so they can get involved in the action and make the memories that will last a lifetime! You don’t have to own the biggest and baddest Nerf Gun available, however very helpful, but any Nerf Gun, even a single shot, anything is better than nothing! 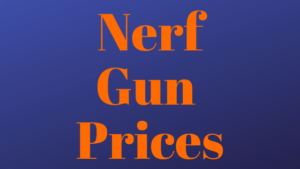 If you are reading my site right now, I know you are a Nerf Gun enthusiast and I want to give you a place to look at and compare different Nerf Guns to make sure you find the best one to fit your style and make sure you get an edge on your enemy! 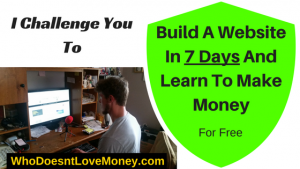 I said above that I chose website building as my career so of course the overall goal is to create an income, but that is the best part about what I do. I never force anyone to do anything, I offer you my advice and overall reviews of each Nerf Gun and I give you the option to purchase each one from Amazon.com, I only earn sales commission when you decide to make a purchase, if you don’t, That’s Just Fine, I hope you were able to learn a little more about a certain Nerf Gun you were interested in, that is my main goal, get you more informed, if you like my info and are interested in making a purchase, I can only ask you to use my banners, but you do not have to! If you have read this whole page, there could be a chance you are interested in building websites like I do, this is a much smaller goal of this website, but still a goal, I want to offer you my assistance if you are interested in learning how to build a website and how to earn a full time income with your own website. I chose Nerf Guns, you can choose whatever you want. 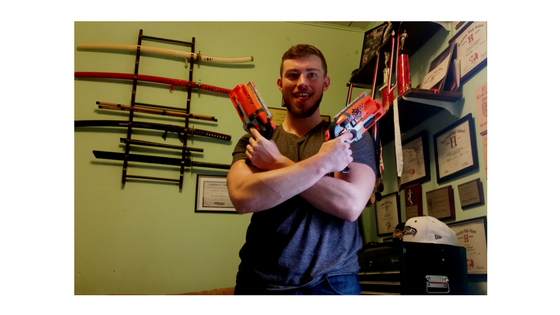 If you have learned what you needed about the Nerf Gun you were interested in, that is a success to me, if you purchase a Nerf Gun, leave a comment at the bottom of the Nerf Gun Review you just got to help others get an edge on their enemy! I really enjoyed learning more about Nerf Guns on your site. My son is a huge fan of these guns and I find the darts all over the place at home. Thanks for creating this site! You will make him better and I know you will have a blast yourself! Awesome, Keep Up The Nerf Gun Research! Hi! I was wondering if you’d be doing reviews of previous generations of Nerf, no longer in production, such as the original N-Strike Series, or the other yellow and blue guns of the early 2000’s like the 6-shot Maverick? Hey Evan, I actually have a 6 shot Maverick, that was my first Nerf Gun, however, I am only currently doing reviews on Nerf Guns in production today and not discontinued ones. I would like to offer you this, to help NerfGunRUs.com out if you are willing to do so. 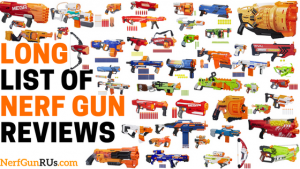 If you would be willing to write reviews of previous Nerf Guns, I would take a look at those and put them under a new tab here at NerfGunRUs.com, Fan Reviews. 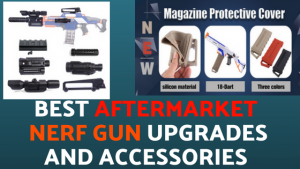 Let me know if you are interested and feel free to send any reviews to my email in NerfGunRUs.com’s contact area. Thanks for the comment Evan!